Dave King today has made the extraordinary admission that all the loans his company and other investors have made into Rangers since he took over are in fact clean investment and will not be getting repaid at all. Speaking today with regards a bunch of issues, the South African-based businessman confirmed he doesn’t expect any of his capital to be returned, and that all other loans into Rangers follow the same protocol. "The understanding with the football management team is that if we sell players they get the money back to spend, so it was never going to be used to repay the loans. There is no intention of repaying the loans, it’s not going to happen, no loans will be repaid, so that wouldn’t have helped us in that regard." Unless we are wildly misunderstanding his wording here, and he only means with sold players, King is confirming that all loans which come in are one way only, and are made with the intention of never receiving repayments. How long this has been the case is unclear, and makes you wonder why they were even called loans in the first place. It’s always been the case. Any loans from any directors or investors would be converted into shares and repaid that way! There was never going to be any cold hard cash passed back across the table. That has me more re-assured and Allan Kerr, what are you doing on here if you have that opinion?? Obsessed should not be on here. When I hear King talk, he assures me. I just didn't really know if he was a TRUE Rangers man. Now, I think he is. I'll cut him some slack. Ok I've tried to stay away from this whole debacle for as long as I can. Loans are a term for a Director putting cash into a business. The term and repayments are at the directors discretion. King is astute here. A loan is not taxable. It is a negative on the balance sheet. He is absolutely right in running the club at a loss. I would too. If it makes a loss there is no corporation tax. He has obviously decided that he had an amount of money he was willing to invest. If he had invested it as a lump sum on a 0 or positive balance that is classed as income and is taxable profit. The man is not stupid and I am beginning to trust his methods. He is looking after the finances just not in an obvious way. He has done everything he said he has done he will invest in the club. 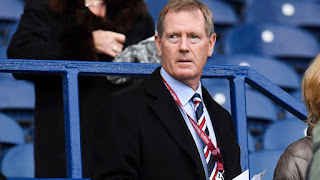 He wants external investment to reduce the risk to himself, long term that means the risk is less for Rangers as he will act as the guardian with sponsorship etc reducing the load on his asset stability that are covering the licences to sfa and UEFA financial rules on the loans. By switching these loans to shares(I might be misinformed on this part) it is at very least the most tax efficient way of investing the owed money into the club. 20% of the club's earnings dont need to go to the HMRC at this time and can be used to stabilise the club. I am no financial guru but this is my take. His only let down really has been choice of managers. I think he is fully aware of this shortcoming here. His other comments to do with Celtuc folding like a pack of cards are ill advised. CFC have spent very little and are fine surviving a few seasons without champions league football. Absolutely, as he should. At the end of the day it's business. The rules are set out by the HMRC. People are with astute and manage the tax system well or do not and end up with EBT type scenarios. Excellent input Stuart ..bang on as far as playing it clever and business astute . Perhaps if they were to sell RFC - then that money would be transferred to their individual/personal bank accounts. Could be considered as a loan against that. King has been clear about this from the beginning. Because he didn't have control, he couldn't turn the loans into shares. A share issue before we got rid of Ashley would have helped him maintain his shareholding. So they lent money which would be turned into shares when they were able. Had to get, I think, 70 or 75% support to do this. Failed by a whisker first time as Super Ally didn't support with his 1.5%. Passed 2nd time. So no secret, always advertised. It's why we are debt free to all intent and purpose. Can't agree with your comments. What physical evidence is there of your claim? Not more shares are we going keep doing things this way how many shares can a club have?,i did read Mr King was to pay back £10 million back to the share holders back money due at 20p a share and now we have to fork out more for more shares is this the best way forward i need to know is this the only way?. It's a good way of getting rid of the loan debt without the club repaying the loans in cash.So there will be a share issue of 6 million worth and the 10 million loan will be turned into shares and handed to the loan provider as payment. It jist means people who want to own 6 million quids worth of share in Rangers can. Tgis is all legal and good business practice. Most of the comments are pretty pointless or your own opinion based on what you think you know or how much you believe in Mr King. If you wanted a clear picture, we would have Audited Accounts, we would then have a clear picture of the True running costs, our real worth today, then you could determine whether or not your Purchase of News Shares might be a sound investment or indeed whether you should renew your season ticket (less risky), me I am def going on Holiday!! Why did two Directors resign - no reason put forward by the club. The internal investment from King has completely dried up and this mirrored by the requirement to borrow money from Close Brothers - nothing soft about that - will definitely need to be repaid. I have a feeling that some of the share issue cash will need to used to repay some of that debt. And SJ's ramblings about the virtues of running at a loss are garbage - does he not know the Eufa have stopped two clubs from playing in Europe because of the financial irregularities that appear to exist at Rangers??? ?